Journey. Photograph by Suzanne Shoemaker. 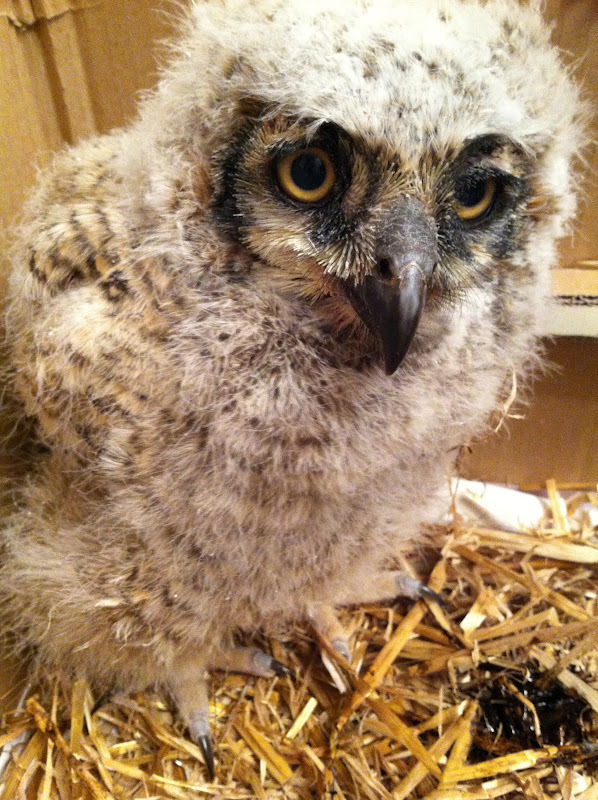 The next call concerning a grounded Great Horned Owlet came from Melinda. Her husband, an excavator, had brought home this baby from a job site in Thurmont, MD the night before. He had found it on the ground and observed one of its parents defending it from a hawk before retrieving it. Melinda fed it raw beef that evening and morning, and then had to leave it at home when she went to work. 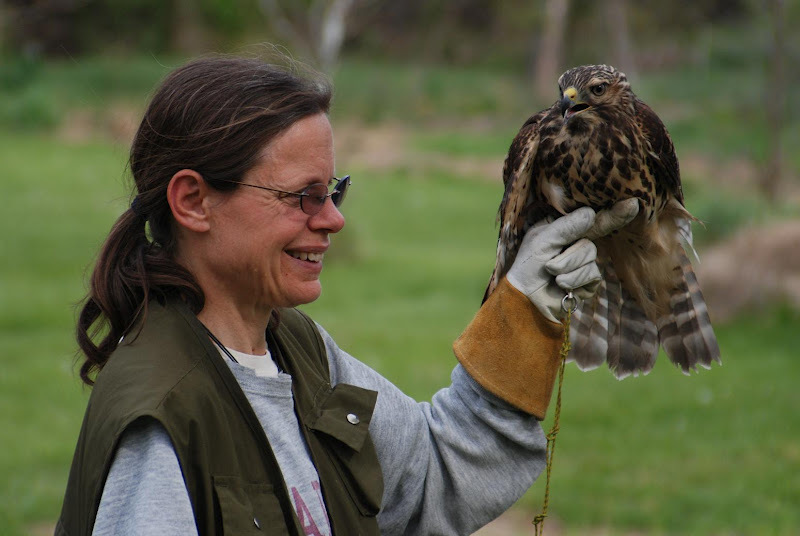 She called Second Chance later that morning and was referred to Owl Moon Raptor Center. When I spoke to Melinda I advised her of my goal to return it to its parents, either in the existing nest or an artificial one. In the interim I would pick it up and take it to Owl Moon where it would receive a complete diet of whole mice. Raw beef may be okay in an emergency, but raptor chicks need the whole animal (including bones and organs), for proper nutrition, and will quickly develop metabolic and developmental problems on a diet of raw beef. Melinda agreed, and when I picked the owlet up she told me she would call me with the address and contact information of the people who owned the property where the owlet was found. The only word I got back was a text saying that trees were being cut down on the nest site property. 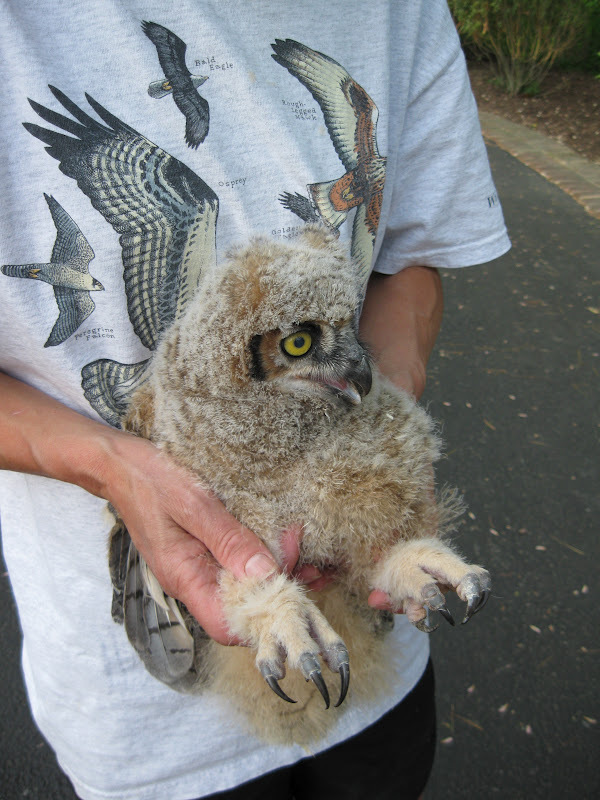 The tree cutting explained why the baby ended up on the ground, but it provided no useful information for reuniting this owlet with her parents, which was still a possibility even in light of the tree cutting. Alas, this baby, only two to three weeks of age, was now officially an orphan. She needed a foster nest. An orphan can be placed with other parents as long as the chicks are close in age. The foster parents will care for it as if it is one of their own. This was a problem because it is already late in the nesting season for Great Horned Owls in our area. Most young owls, like Twilight and Gylfie, are already leaving the nest. I put out a call for help to all the birding folks I know. I got a great response, but days passed, and no suitable nest was found. Each passing day increases the risk of a lone young orphan becoming habituated, or worse, imprinted to people. I was taking every precaution to minimize human contact, but I needed to get her with other owls soon, for this baby to have any chance of success in the wild. Meanwhile, I had visitors! 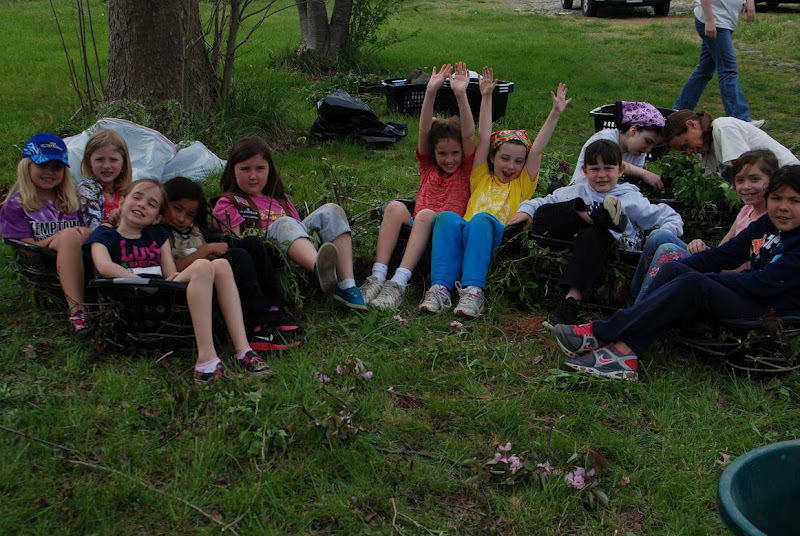 A troop of 12 young Girl Scouts (Brownies) from Iamsville, MD arranged to visit Owl Moon Raptor Center for an ambitious nest-building project. This project was the culmination of a lot of planning and organizing by the girls, and its completion would earn them their Journey Badge. 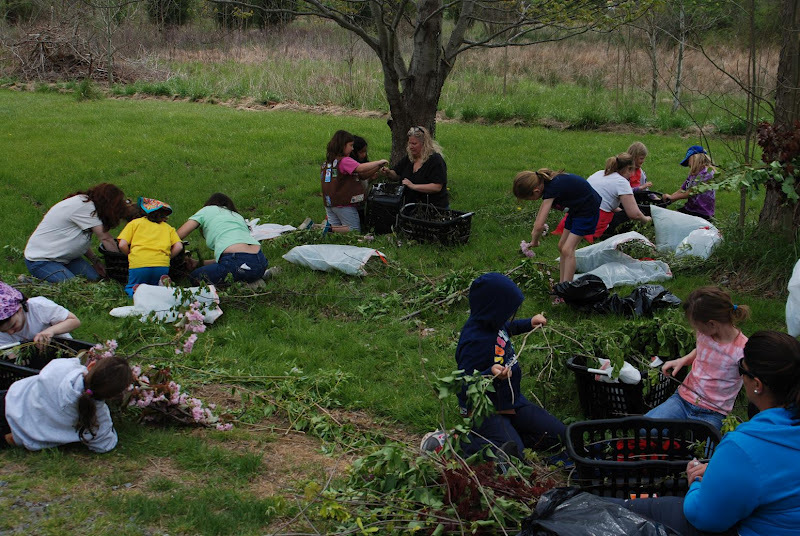 They arrived on Saturday, April 14, in several vehicles, and began unloading the supplies they had gathered and purchased: 12 laundry baskets of camouflage colors, and at least that many trash bags full of green twigs and branches they had clipped from trees and shrubs in their yards. We talked about the need for these nests, and how they would be used to reunite young raptors with their parents. I showed them an example of what we were making, and they went right to work. 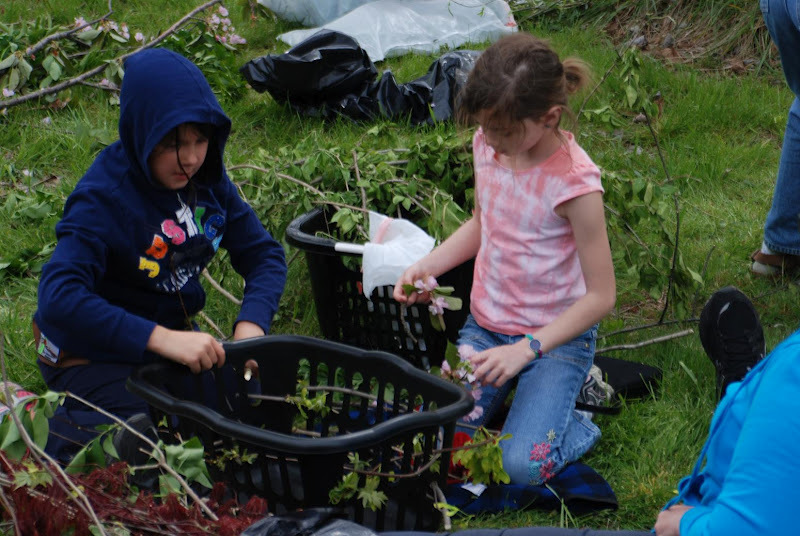 It is not easy for little fingers to weave twigs through openings in a laundry basket and between other twigs. I was impressed by their strength and determination to do a good job, and persistence to get the job done. 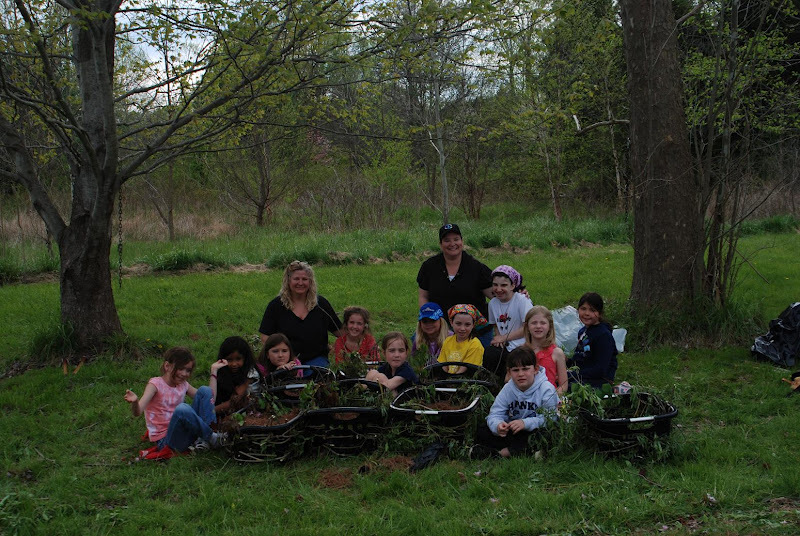 We opted to work in teams with parents assisting, and managed to complete seven beautiful nests in only two hours’ time! The girls lined each one with a soft bed of pine needles they gathered and carried from my neighbor’s yard with her consent. Before we concluded, I showed them photographs of my raptor patients, including the orphaned nestling great-horned owl. I asked the girls to come up with a name for her, and after several great suggestions and discussion, they decided to call her “Journey.” It was the perfect name. 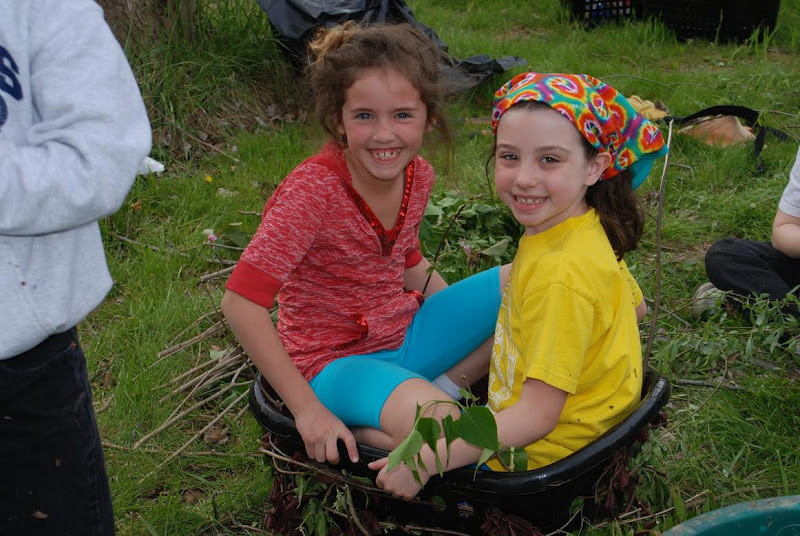 The owl was just beginning her life’s journey, as the Brownies were completing their Journey Badge. I told them I hoped Journey would be the first to use one of their nests. 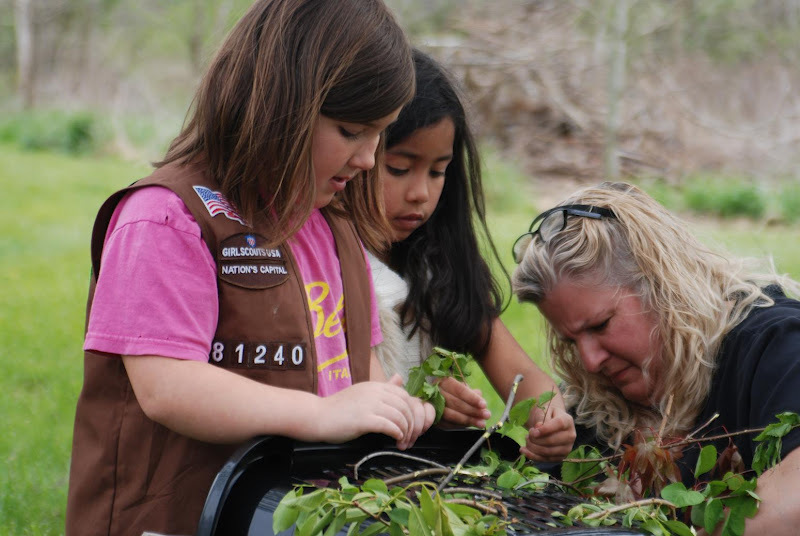 The troop works on nest baskets. Photograph by Pamm Shankman. Regan and Chasie working on a nest. Photograph by Pamm Shankman. Wendy and Valerie weaving branches. Photograph by Pamm Shankman. Abby examines her nest. Photograph by Pamm Shankman. Abby and Charlene test out their final product. Photograph by Pamm Shankman. Yup! These baskets should be comfy enough for owls. Photograph by Pamm Shankman. The troop shows off the results of their hard work. Photograph by Pamm Shankman. After the Brownies had completed their nest baskets I brought Squeak-toy out for some job training. As an education bird he will need to be relaxed and comfortable in front of groups. Photograph by Pamm Shankman. As luck would have it, the very next day fate intervened. I got a call from Second Chance about a baby owl found on the ground in Potomac, MD. When I returned the call I spoke with Lee, who had found it on her front walkway that morning. She was not sure what species of owl she had. As I drove to Potomac, I prayed that it would be a healthy great horned owl, the same age as Journey. 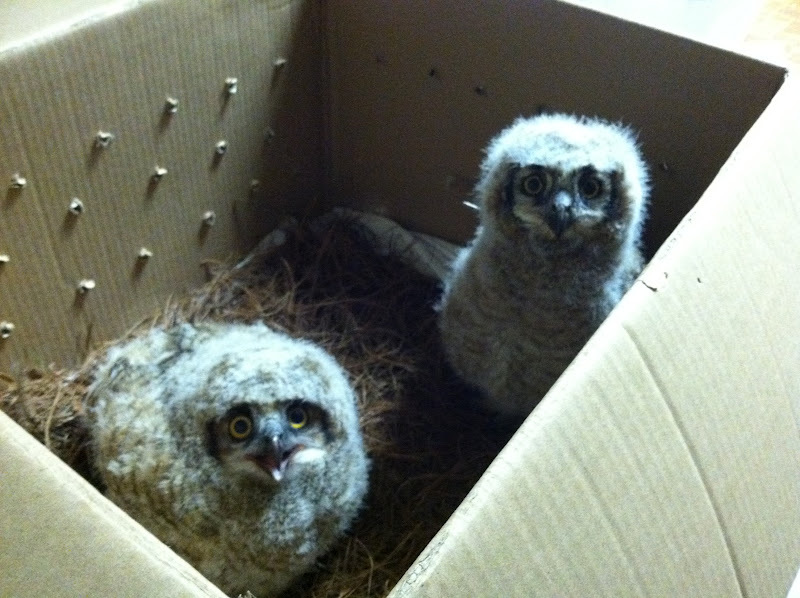 Lee led me to a box they had sheltered the owlet in, under a tree in their yard. I held my breath when I looked inside. He could have been Journey’s brother! 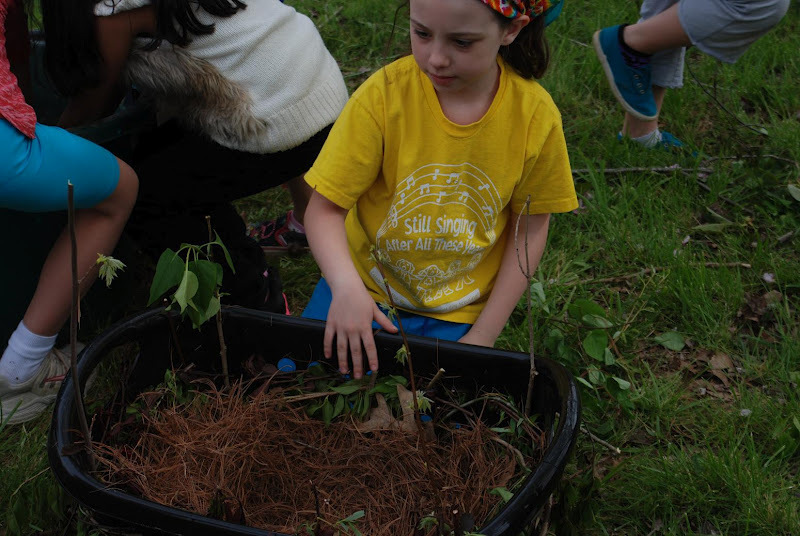 We searched for the nest by looking on the ground for the remains of prey, such as bones, fur, and feathers, and owl droppings. It was easy to know when we found it. A good chunk of the nest was on the ground on the driveway below a tall White Pine. Owls don’t build their own nests. Instead they use the old nests of crows and hawks, which are often in pretty poor condition. What remained of this nest was at the top, in the crotch of two large limbs. We scoured the yard, and the remaining nest, for a possible sibling, as there are often two and occasionally three chicks in a brood. None were found. This made for an ideal fostering situation for Journey. We could put her in a nest basket with this owlet, who was named “Alan” by Lee’s daughter, Lily. Alan’s parents would take care of both chicks. We would have to wait until the next evening to put the nest basket in the tree, as it was too late to arrange for Jason and Mike to climb that evening. I took this Alan back to Owl Moon, and introduced him to his new sibling, Journey. That night Journey and Alan were introduced. Photograph by Suzanne Shoemaker. 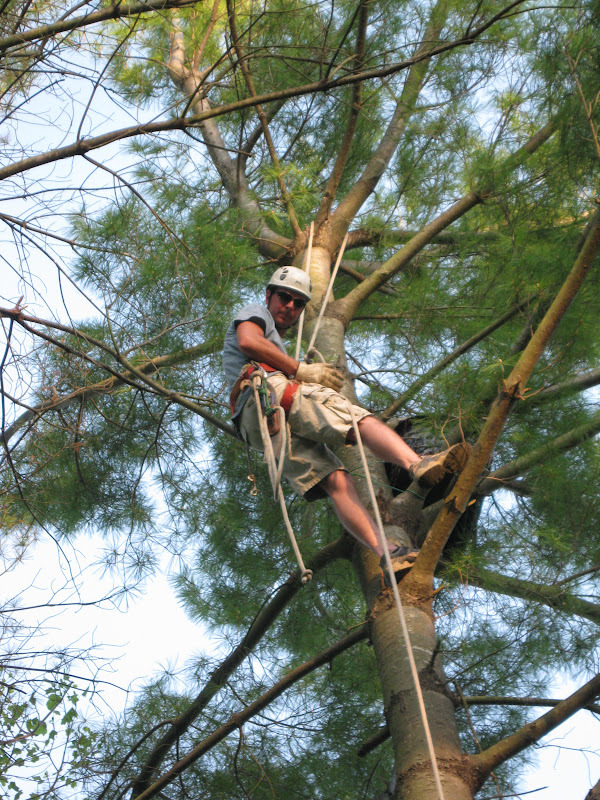 Jason and Mike already had the climbing ropes in place in a tree near the nest tree when Lee Prouty and I arrived the next evening. We had decided against putting the nest basket in the original nest tree because it overhung the paved driveway. The chosen tree overhung the lawn, and would provide a soft landing should one of the owlets come down a second time. Lee (the finder) and her daughters, Lily and Lexi, looked on and took pictures while Ken Smith, a licensed raptor bander, banded both owlets. Then I gave each owlet a parting meal of mice to hold them over until mom and dad took over feeding duties. We proceeded with re-nesting, just as we had done with Twilight and Gylfie. Only with Journey and Alan, who were about three weeks younger, we didn’t worry that they would try to “flee the scene.” They settled into their new nest immediately. Jason climbs the tree we have chosen to site the nest basket in. Photograph by Suzanne Shoemaker. I hold Alan so that Ken can band him. Photograph by Ken Smith. Journey and Alan, banded and well fed, now ready to ride up to their new nest in a soft cooler. Photograph by Ken Smith. Lee Prouty and I hung around with Lee and Lily until after dark, watching and listening for evidence of the reunion. We heard lots of calling, both adult and juvenile over the next hour or so. Some of the calling was coming from the nest tree, which was an indication that perhaps Alan had a sibling after all. Then we saw an adult fly into the original nest and heard signs of a juvenile responding to a meal, which all but confirmed that we had inadvertently added a third chick to the brood. 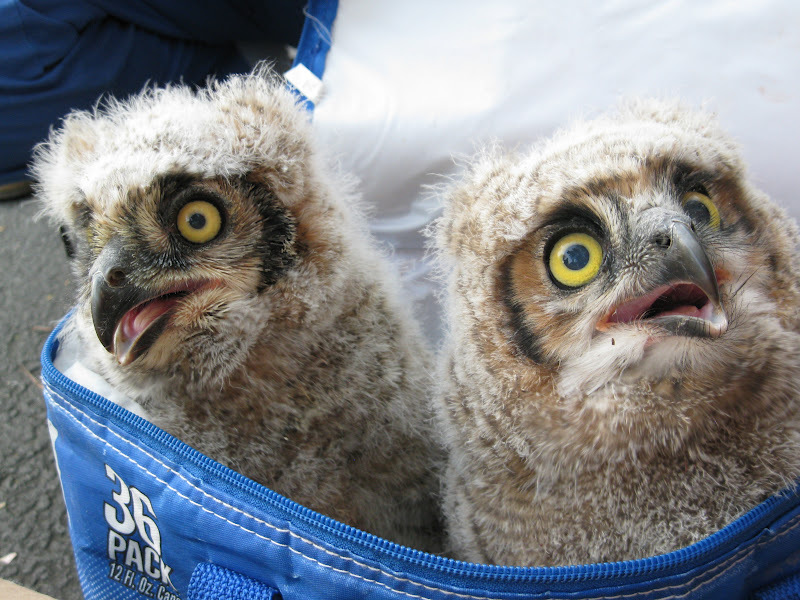 Great Horned Owls have triplets of their own sometimes, but I would have thought twice had I known in advance. However, under these circumstances, with no good alternative for Journey I probably would have gone ahead anyway. That evening, having just received a meal from me, Journey and Alan were quiet. Tuesday morning, Lee, Lexi, and Lily were up early, with binoculars on the nest at first light. They “were thrilled to see the wide wingspan of the mother in the new nest attending to her baby, as well as her newly adopted baby!” Alan was back with his parents, and Journey’s new journey had begun! Fantastic! Beautiful pics. So glad they’re happy in a new home! Great work. Mrs. Shoemaker, we loved naming the bird Journey and we are glad that she has a great new home with Alan’s family. We hope that Journey has a good new life with his new parents. Thank you for letting us help make the baskets. Signed, from your new Brownie friends in Frederick County. You are welcome! I thank you, my Brownie friends!